For other people named John Carmack, see John Carmack (disambiguation). John D. Carmack (born August 20, 1970) is an American game programmer, aerospace and virtual reality engineer. He co-founded id Software. Carmack was the lead programmer of the id video games Commander Keen, Wolfenstein 3D, Doom, Quake, Rage and their sequels. 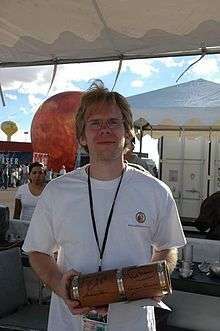 Carmack is best known for his innovations in 3D graphics, such as his famous Carmack's Reverse algorithm for shadow volumes, and is also a rocketry enthusiast and the founder and lead engineer of Armadillo Aerospace. In August 2013, Carmack took the position of CTO at Oculus VR, which in 2014 became a subsidiary of Facebook. Carmack, son of local television news reporter Stan Carmack, grew up in the Kansas City Metropolitan Area where he became interested in computers at an early age. He attended Shawnee Mission East High School in Prairie Village, Kansas and Raytown South High School in nearby Raytown, Missouri. As reported in David Kushner's Masters of Doom, when Carmack was 14, he broke into a school to help a group of kids steal Apple II computers. To gain entry to the building, Carmack concocted a sticky substance of thermite mixed with Vaseline that melted through the windows. However, an overweight accomplice struggled to get through the hole, and opened the window, setting off a silent alarm and alerting police. John was arrested, and sent for psychiatric evaluation (the report mentions 'no empathy for other human beings' and describes Carmack as 'a brain on legs'). Carmack was then sentenced to a year in a juvenile home. He attended the University of Missouri–Kansas City for two semesters before withdrawing to work as a freelance programmer. Softdisk, a computer company in Shreveport, Louisiana, hired Carmack to work on Softdisk G-S (an Apple IIGS publication), introducing him to John Romero and other future key members of id Software such as Adrian Carmack (not related). Later, this team would be placed by Softdisk in charge of a new, but short-lived, bi-monthly game subscription product called Gamer's Edge for the IBM PC (DOS) platform. In 1990, while still at Softdisk, Carmack, Romero, and others created the first of the Commander Keen games, a series that was published by Apogee Software, under the shareware distribution model, from 1991 onwards. Afterwards, Carmack left Softdisk to co-found id Software. Carmack has pioneered or popularized the use of many techniques in computer graphics, including "adaptive tile refresh" for Commander Keen, raycasting for Hovertank 3-D, Catacomb 3-D, and Wolfenstein 3-D, binary space partitioning which Doom became the first game to use, surface caching which he invented for Quake, Carmack's Reverse (formally known as z-fail stencil shadows) which he devised for Doom 3, and MegaTexture technology, first used in Enemy Territory: Quake Wars. Carmack's engines have also been licensed for use in other influential first-person shooters such as Half-Life, Call of Duty and Medal of Honor. In 2007, when Carmack was on vacation with his wife, he ended up playing some games on his cellphone, and decided he was going to make a "good" mobile game. On August 7, 2013, Carmack joined Oculus VR as their CTO. On November 22, 2013, he resigned from id Software to work full-time at Oculus VR. Carmack's reason for leaving was because id's parent company ZeniMax Media didn't want to support Oculus Rift. Around 2000, Carmack became interested in rocketry, a hobby of his youth. Reviewing how much money he was spending on customizing Ferraris, Carmack realized he could do significant work in rocketry and aerospace. He began by giving financial support to a few local amateur groups before starting Armadillo Aerospace. Carmack funded the company out of his own pocket, for “something worth of a million dollars a year.” Carmack taught himself aerospace engineering and was the lead engineer of the company. The company made steady progress toward their goals of suborbital space flight and eventual orbital vehicles. In October 2008, Armadillo Aerospace competed in a NASA contest known as the Lunar Lander Challenge, winning first place in the Level 1 competition along with $350,000. In September 2009, they completed Level 2 and were awarded $500,000. The company went into "hibernation mode" in 2013. Carmack is a well-known advocate of open source software, and has repeatedly voiced his opposition to software patents, which he equates to "mugging someone". He has also contributed to open source projects, such as starting the initial port of the X Window System to Mac OS X Server and working to improve the OpenGL drivers for Linux through the Utah GLX project. Carmack released the source code for Wolfenstein 3D in 1995 and the Doom source code in 1997. When the source code to Quake was leaked and circulated among the Quake community underground in 1996, a programmer unaffiliated with id Software used it to port Quake to Linux, and subsequently sent the patches to Carmack. Instead of pursuing legal action, id Software, at Carmack's behest, used the patches as the foundation for a company-sanctioned Linux port. id Software has since publicly released the source code to Quake, Quake 2, Quake 3 and lastly Doom 3 (including, later, the BFG Edition), all under the GNU General Public License (GPL). The Doom source code was also re-released under the GPL in 1999. The id Tech 4 engine, more commonly known as the "Doom 3 engine", has also been released as open source under the GPL. The source code for Hovertank 3D and Catacomb 3D (as well as Carmack's earlier Catacomb) was released in June 2014 by Flat Rock Software with Carmack's blessing. 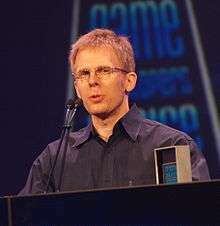 On the other hand, Carmack has several times over the years voiced a skeptical opinion about Linux as gaming platform, for instance in 2013 he argued for emulation "as proper technical direction for gaming on linux" and in 2014 he voiced the opinion that Linux might be the biggest problem for the success of the Steam Machine. Carmack is also noted for his generous contributions to charities and gaming communities. Some of the recipients of Carmack's charitable contributions include his former high school, promoters of open source software, opponents of software patents, and game enthusiasts. In 1997, he gave away one of his Ferraris (a 328 model) as a prize to Dennis Fong, the winner of the Quake tournament "Red Annihilation". Carmack met his wife Katherine Anna Kang at QuakeCon 1997 when she visited id's offices. As a bet, Kang challenged Carmack to sponsor the first All Female Quake Tournament if she was able to produce a significant number of participants. Carmack and Kang married on January 1, 2000 and planned a ceremony in Hawaii. Steve Jobs requested that they postpone the ceremony so Carmack could attend the MacWorld Expo on January 5, 2000. Carmack and Kang declined and made a video instead. Carmack and Kang had a son in 2004. Carmack has a blog last updated in 2006 (previously a .plan), an active Twitter account, and also occasionally posts comments to Slashdot. As a game developer, Carmack stands apart from many of his contemporaries by avoiding commitment to a final release date for any game he is developing. Instead, when asked for a release date on a new title, Carmack will usually reply that the game will be released "when it's done." Employees at Apogee, in their past years the publishers of games by id Software, adopted this business practice as well. Other game developers, such as Blizzard Entertainment and Valve, have made similar statements. Carmack supported the 2012 presidential campaign of Republican Ron Paul. Carmack is known as a staunch libertarian and a fan of Thomas Sowell. Carmack loves pizza. During his time at id Software, a medium pepperoni pizza would arrive for Carmack from Domino's Pizza almost every day - carried by the same delivery person for more than 15 years. Carmack had been such a regular customer that they still charge him 1995 prices. Carmack has on occasion commended the efforts of similarly focused programmers. First Ken Silverman, who wrote the Build engine for 3D Realms, and later with Tim Sweeney of Epic Games, who writes the Unreal Engine. 000000001996-01-01-00001996 Named among the most influential people in computer gaming of the year and of all time #1 and #2 in GameSpots lists. 000000001997-01-01-00001997 Named among the most influential people of all time #7 in Computer Gaming World list, for game design. 000000001999-01-01-00001999 Named among the 50 most influential people in technology #10 in Time's list. 000000002001-03-01-0000March 2001 Award for community contribution for the Quake 3 engine Used in 12 games. Bestowed at 2001 Game Developer's Conference Award Ceremony. 000000002001-03-22-0000March 22, 2001 Inducted into Academy of Interactive Arts and Sciences' Hall of Fame The fourth person to be inducted, an honor bestowed upon those who have made revolutionary and innovative achievements in the video and computer game industry. 000000002002-01-01-00002002 Named to the MIT Technology Review TR100 Included as one of the top 100 innovators in the world under the age of 35. 000000002003-01-01-00002003 One subject of book Masters of Doom Masters of Doom is a chronicle of id Software and its founders. 000000002005-01-01-00002005 Name in film The film Doom featured a character named Dr. Carmack, in recognition of Carmack who co-created the original game. 000000002006-03-01-0000March 2006 Added to the Walk of Game Walk of Game is an event that recognizes the developers and games with the most impact on the industry. 000000002007-01-01-0000January 2007 Awarded 2 Emmy Awards Carmack and id Software were awarded with two Emmy Awards. The first was Science, Engineering & Technology for Broadcast Television, which includes broadcast, cable and satellite distribution. The second was for Science, Engineering and Technology for Broadband and Personal Television, encompassing interactive television, gaming technology, and for the first time, the Internet, cell phones, private networks, and personal media players. id Software is the very first independent game developer to be awarded an Emmy since the Academy began honoring technology innovation in 1948. 000000002007-09-01-0000September 2007 Television appearance Appeared on Discovery Channel Canada Daily Planet featuring his rocket designs along with the Armadillo Aerospace team. 000000002008-01-01-00002008 Honored Carmack was honored at the 59th Annual Technology & Engineering Emmy Awards for Quake's pioneering role of user modifiability. He is the only game programmer ever honored twice by the National Academy of Television Arts & Sciences, having been given an Emmy Award in 2007 for his creation of the 3D technology that underlies modern shooter video games. Along with Don Daglow of Stormfront Studios and Mike Morhaime of Blizzard Entertainment, Carmack is one of only three game developers to accept awards at both the Technology & Engineering Emmy Awards and at the Academy of Interactive Arts & Sciences Interactive Achievement Awards. 000000002008-10-01-0000October 2008 Won X-Prize Carmack's Armadillo Aerospace won the $350,000 Level One X-Prize Lunar Lander Challenge. 000000002010-03-11-0000March 11, 2010 Lifetime Achievement Award Was awarded the Game Developers Conference Lifetime Achievement award for his work. March 7, 2016 BAFTA Fellowship Award Honoured with the Academy's highest honour, the Fellowship for "work that has consistently been at the cutting edge of games and his technical expertise helping the future arrive that little bit faster". Titles are listed below in reverse chronological order. 1 2 McWhertor, Michael (22 November 2013). "id Software founder John Carmack resigns". ↑ "John Carmack Joins Oculus as CTO". oculusvr. Oculus VR. Retrieved 7 August 2013. ↑ "John Carmack Answers". Games.slashdot.org. 1999-10-15. Retrieved 2012-11-27. ↑ Kushner, David. Masters of Doom. Random House. p. 21. ISBN 978-1-58836-289-6. ↑ Kang, Anna (October 18, 2007). "Q&A: Fountainhead's Kang Talks Orcs & Elves DS, Wii Possibilities"
↑ Snider, Mike (18 July 2007). "Q&A with id Software's Kevin Cloud and Steve Nix". USA Today. ↑ Wilhelm, Alex. "Doom's John Carmack Leaves id Software To Focus On The Oculus Virtual Reality Headset". ↑ Yin-Poole, Wesley (5 February 2014). "Why John Carmack quit id Software". Eurogamer. Gamer Network. Retrieved 5 February 2014. 1 2 Foust, Jeff (August 1, 2013). "Carmack: Armadillo Aerospace in "hibernation mode"". NewSpace Journal. Retrieved August 6, 2013. ↑ Michaels, Patrick (September 14, 2009). "Rocket Men From Mesquite's Armadillo Aerospace Are in Line For $1 Million X Prize". Dallas Observer. Retrieved September 14, 2009. ↑ "International Space Fellowship". Spacefellowship.com. Retrieved 2012-11-27. ↑ "Lunar lander qualifies for prize - Cosmic Log". Cosmiclog.msnbc.msn.com. Retrieved 2012-11-27. ↑ "Are Video Game Patents Next?". Slashdot. 2005-06-01. Retrieved 2012-11-27. ↑ "TTimo/doom3.gpl · GitHub". Github.com. Retrieved 2012-11-27. ↑ Carmack, John. "Twitter / @ID_AA_Carmack: Thanks to Flat Rock...". ↑ Chalk, Andy (2013-02-06). "John Carmack Argues Against Native Linux Games". The Escapist. Retrieved 2013-09-29. He reiterated his support for improving emulation as the "proper technical direction for gaming on Linux," noting that native ports don't do much that a good emulator wouldn't be able to handle. ↑ "Dennis Fong | CrunchBase Profile". Crunchbase.com. Retrieved 2012-11-27. ↑ "GameSpy: John Carmack: QuakeCon 2008 Keynote Highlights - Page 6". Pc.gamespy.com. Retrieved 2012-11-27. ↑ "DNF Dallas Business Journal Article, 2008, and stuff - Page 4 - 3D Realms Forums". Forums.3drealms.com. Retrieved 2012-11-27. ↑ GamePro Staff (2006-08-29). "GamePro Q&A: Blizzard's Jeff Kaplan on The Burning Crusade". GamePro. Archived from the original on 2009-01-14. Retrieved 2006-09-30. ↑ "Page by Page Report Display (Page 5052 of 7433)". Federal Election Commission. Retrieved 13 March 2014. ↑ "VR Legend John Carmack Persuaded the Libertarian Party of Texas to Accept Bitcoin Donations - CCN: Financial Bitcoin & Cryptocurrency News". 17 October 2014. ↑ "Amazon.com: John Carmack's review of The Thomas Sowell Reader". ↑ "Having a reasonable grounding in statistics and probability and no belief in luck, fate, karma, or god(s), the only casino game that interests me is blackjack," he wrote in a .plan file." - John D. Carmack, David Kushner, Masters of Doom: How two guys created an Empire and transformed Pop Culture (2003). ↑ Thomsen, Michael (June 2011). "The Deathmatch Daydreams of Tim Willits". Electronic Gaming Monthly (248): 23–24. ↑ "John Carmack Answers". Slashdot. 1999-10-15. Retrieved 2015-12-10. ↑ "GameSpot - /features/15most/html/mi96_01.html". Liveweb.archive.org. Retrieved 2012-04-12. ↑ "Internet Archive Wayback Machine". Web.archive.org. 2005-02-06. Archived from the original on 2005-02-06. Retrieved 2012-04-12. ↑ Time Digital 50 from Time Archived March 1, 2011, at the Wayback Machine. ↑ "2002 Young Innovators Under 35". Technology Review. 2002. Retrieved August 16, 2011. ↑ "Internet Archive Wayback Machine". Web.archive.org. 2009-02-26. Archived from the original on 2009-02-26. Retrieved 2012-11-27. ↑ "National Television Academy Announces Emmy Winning Achievements: Honors Bestowed at 58th Annual Technology & Engineering Emmy Awards" (PDF). Emmyonline.org. Retrieved 2012-11-26. ↑ Contact Brian Ashcraft: Comment (2008-01-08). "2008 Tech Emmy Winners". Kotaku.com. Retrieved 2012-11-27. ↑ "John Carmack & id Software take Two Emmy Awards! - VirtualChaos – Nadeem's blog". ↑ "Armadillo Wins Lunar Lander Challenge Level 1, Crashes On 2". Gizmodo.com. 2008-10-27. Retrieved 2012-11-27. ↑ "2010 Game Developers Choice Awards to Honor John Carmack of id Software With... - SAN FRANCISCO, Feb. 22 /PRNewswire/". Prnewswire.com. Retrieved 2012-11-27. ↑ "John Carmack | BAFTA Fellowship in 2016". www.bafta.org. Retrieved 2016-04-08. Kushner, David (2003). Masters of Doom: How Two Guys Created an Empire and Transformed Pop Culture, New York: Random House. ISBN 0-375-50524-5.